When called on to implement HR processes that come up on a regular basis, some HR professionals might feel they know what to do off by heart; however, other, less familiar processes might cause a bit more head scratching. We run down the top 10 HR procedures that XpertHR Liveflo flowcharts have been guiding users through so far this year. Whether you have been carrying out these procedures for years or are new to HR, reliable guidance to lead you through the key stages can avoid important legal risks being overlooked. Few redundancy programmes are straightforward and the more people they affect, the more likely it is that HR might have to deal with unusual scenarios. This redundancy workflow can be used where a business or workplace is closing, or there is a diminished need for employees to carry out work. Not only does it include steps such as redundancy selection, collective consultations and calculating redundancy pay, it also includes “what if” scenarios such as a potentially redundant employee being on maternity or paternity leave, and what to do if the business needs to retract notice of redundancy. This discipline workflow guides employers through possible misconduct issues in line with the “Acas code of practice on disciplinary and grievance procedures”. It covers carrying out a fair investigation, holding a disciplinary meeting and offering the right of appeal. The workflow caters for potential curve balls such as employee sickness, failure to attend meetings and the situation where an employee raises a grievance during the disciplinary process. The pregnancy and maternity workflow helps with everything from how the employee’s work will be covered while she is on maternity leave, to calculating her maternity pay. What if the employee becomes pregnant again while already on maternity leave? What if she receives a pay rise while she’s on leave? Both these questions, and more, are considered. The terms and conditions workflow is used to vary the contract of one or more of your employees in accordance with good practice and the obligation to consult over proposed changes. Use this grievances workflow to deal with a formal grievance in line with the “Acas code of practice on disciplinary and grievance procedures”, from the initial investigation stage through to the appeal stage and final decision. It covers what to do if an employee persistently raises trivial grievances or grievances covering issues that have already been dealt with. Pensions auto-enrolment is being phased in over a period of six years from 2012. All employers have a staging date, from which their auto-enrolment duties begin. 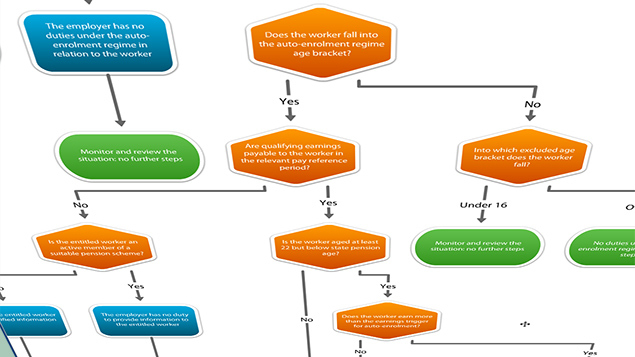 If your organisation’s staging date is still to come, use this pensions auto-enrolment workflow to prepare. If an employer that is required to undertake TUPE consultation does not recognise a trade union and has no appropriate existing employee representatives, it will need to arrange an election. There will be a limited exception to this rule, allowing micro-businesses to consult directly with employees, but this applies only where the transfer will take place on or after 31 July 2014. Until then, even the smallest employers will have to go through the election process, including deciding on the election rules, inviting nominations for candidates, arranging the ballot and announcing the result. Use this TUPE workflow to carry out an election of employee representatives for information and consultation purposes in accordance with the requirements of the TUPE Regulations 2006. Pensions auto-enrolment is an ongoing process, so even if your organisation’s staging date has passed and you have introduced auto-enrolment for your employees, you cannot sit back and relax. You will need to continue to assess individuals, for example to assess whether a workers’ earnings have reached the trigger for auto-enrolment, when there is a new member of the workforce or when a worker opts in to a qualifying pension scheme. Use this pensions auto-enrolment workflow to determine an individual’s category for auto-enrolment purposes and to ascertain your duties in relation to him or her. Use this paternity workflow when an employee informs you that he plans to take ordinary paternity leave in respect of a new baby that is expected shortly. If the employee subsequently changes his mind and wants to start his leave on different dates, do you have to agree to this, especially if you have already arranged cover? What if the baby has not been born by the start date of the paternity leave? The workflow gives guidance on what to do in these scenarios. Use this resignation workflow to deal with an employee’s resignation, bearing in mind the employee’s contractual obligations regarding matters such as notice, restrictive covenants and the return of company property. A resignation might come out of the blue, so employers should ensure that they are prepared for how to respond. For example, do you want to try to persuade the employee to stay? Do you need to prevent him or her from having access to confidential information that could be valuable to his or her new employer? Would a period of garden leave be appropriate? This workflow takes you through what you need to consider at each stage, not forgetting the collection and card. Stop leading us to XpertHR and then cutting us off when we get there. Most of us can’t afford a subscription of over £2k, so you’re just wasting our time.